Need a Handicap Wheelchair Ramp for your Modular Building? Here's a couple of quick tips for anyone planning to use a modular building as a classroom or office. Always check with your local planning department about wheelchair access ramps for handicap individuals. In most cases you will need a ramp system to provide the public and employees access the main entrance. You can also read Why You Need a Handicap Ramp here on iModular. Most modular building suppliers can provide you with a price to rent or buy a handicap ramp that meets the Americans with Disabilities Act (ADA) specifications and fits your modular building design and site conditions. The length of the ramp is determined by the height of the bottom of the main entrance door so setting your modular building as low to the ground as possible may save you money and space. 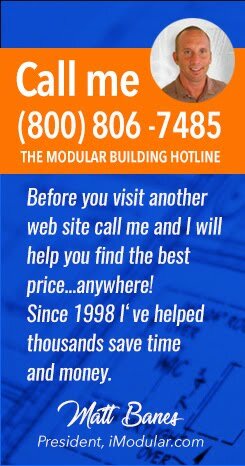 If you have questions ask your local modular building supplier or check with Matt Banes at iModular.com. You can call Matt @ (800) 806-7485.